Data-driven companies share characteristics that help them achieve more and gain a competitive advantage within their industry. The importance of data-driven thinking is not new, but what does it mean in practice? Red Hat and Mammoth Data deliver a modern, cloud-ready architecture using Hadoop and Spark to transform your organization into a data-driven one. A case study, using a real-world situation, will also be a part of this webinar. Red Hat and Cloudera, announce the formation of a strategic alliance. From JBoss perspective, the key objective of the alliance is to leverage big data enterprise-wide and not let Hadoop become another data silo. Cloudera combined with Red Hat JBoss Data Virtualization integrates Hadoop with existing information sources including data warehouses, SQL and NoSQL databases, enterprise and cloud applications, and flat and XML files. The solution creates business-friendly, reusable and virtual data models with unified views by combining and transforming data from multiple sources including Hadoop. This creates integrated data available on-demand for external applications through standard SQL and web services interfaces. The reality at vast majority of organization is that data is spread across too many applications and systems. Most organizations don’t know what they’ve lost because their data is fragmented across the organization. This problem does not go away just because an organization is using big data technology like Hadoop; in fact, they get more complicated. Some organizations try to solve this problem by hard coding the access to data stores. This simple approach inefficiently breaks down silos and brings lock-in with it. Lock-in makes applications less portable, a key metric for future proofing IT. This approach also impedes organizational agility because hard coding data store access is time consuming and makes IT more complex, incurring technical debt. Successful business need to break down the data silos and make data accessible to all the applications and stakeholders (often a requirement for real time contextual services). A much better approach to solving this problem is abstraction through data virtualization. It is a powerful tool, well suited for the loose coupling approach prescribed by the Modern Enterprise Model. Data virtualization helps applications retrieve and manipulate data without needing to know technical details about each data store. When implemented, organizational data can be easily accessed using a simple REST API or via familiar SQL interface. Providing full support for standard based interfaces like REST and OData in addition JDBC and ODBC. Flattening data siloes through a unified data layer. The race to modernize BI: What it is and why so urgent? Data vs creativity: The last battleground? What does it take to apply data science for social good? I wanted to send a follow up posting on more detail on JBoss Data Virtualization 6.2 GA.
JDV 6.2 is supported with EAP 6.4.3. Note that starting with JDV 6.2, we no longer bundle EAP with the JDV product. The user needs to get EAP from a separate download. This allows JDV customers the flexibility to use existing EAP instances (EAP v 6.4.3 and above) that they already have installed, as well as the ability to move to newer versions of EAP more easily. JDV 6.2 extends support for JDG 6.4 by adding capabilities for the JDG 6.4 Domain-specific Language (DSL) translator utilizing Google Protocol Buffer (protobuf) serialization. This enables you to run SQL queries on data stored in JDG remote caches. With JDV 6.1 only key-based access for remote caches was supported. JDV 6.1 JDBC driver was capable of negotiating a new Kerberos token, but was not capable of propagating an existing Kerberos token. Starting with JDV 6.2, the JDBC driver is capable of participating in Kerberos delegation, if the higher order application stack already negotiated a Kerberos token. This leads the way to true SSO from the client application stack to all the way to the data source, if data source also supports Kerberos delegation. The features to enable Kerberos delegation for Oracle and MS-SQL Server, Hive and Cloudera Impala data sources in addition to JDBC were also added. Pushdown query capabilities are extended to include salesforce.com, LDAP, JPA and OLAP data sources. In prior versions of JDV, there was the ability to optionally push an entire query to a JDBC data source unchanged. This allows customers the flexibility to be able to use SQL that is proprietary to a data source directly to the source when necessary, without needing to translate it to SQL 92 in the JDV Engine. 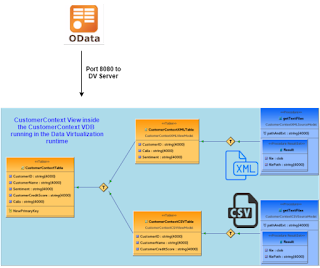 New for JDV 6.2, we extended this capability beyond JDBC to additional data sources. In JDV 6.2, we take advantage of EAP security caching in Modeshape to improve performance when an external security domain, like LDAP, is used. In JDV 6.1, all the ODBC sources utilized ODBC-JDBC bridge provided in Java. With the removal of ODBC-JDBC Bridge in Java 8, a new translator is introduced to read from the MS Access database. Apache HBase is an open source, non-relational, distributed database modeled after Google's BigTable and written in Java. It is developed as part of Apache Software Foundation's Apache Hadoop project and runs on top of HDFS (Hadoop Distributed Filesystem), providing BigTable-like capabilities for Hadoop. In JDV 6.2, we released a resource adapter for Apache HBase that will be officially certified following the JDV 6.2 release. 3. Install DV 6.2 after downloading from the above link. The Data Virtualization 6.2 tooling (Teiid Designer 9.0.3.Final) is available. Note that testers have verified this Designer version with JBDS 8.1.0 (Eclipse Luna). Add DV tooling via the JBoss Central panel select the Software/Updates tab, check JBoss Data Virtualization option and click the Install/Update button. To help you get started we created a getting started example with CSV and XML sources in a customer context scenario. Run one of 3 options to get you started easily. The Teiid Project is included in the repository so you can take a look at the views and preview data before deployment. Take a look at https://github.com/jbossdemocentral/dv-gettingstarted and get started with Data Virtualization 6.2. The following table provides a list of data sources and translators that are supported by Red Hat.